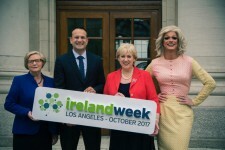 LOS ANGELES, September 7, 2017	(Newswire.com) - IrelandWeek (www.IrelandWeek.com) is proud to announce the inaugural week-long conference and culture festivities from Oct. 16-21, 2017 in Los Angeles, California. In association with Ireland’s Department of Foreign Affairs and Trade, The Irish Film Board, Culture Ireland, Creative Ireland, IDA Ireland, Tourism Ireland, Enterprise Ireland, IrelandWeek’s focus is to bring Ireland to the world, and the world back to Ireland. Sponsors of the week include Aer Lingus, The Ireland Funds, The California Irish Legislative Caucus. Supporters of the project include Music From Ireland, Bord Bia, the American Chamber of Commerce Ireland, The City of Los Angeles and many more. The official media partner of Ireland Week is Irish Times Abroad. Launched by Irish Prime Minister (An Taoiseach) Leo Varadkar, along with the Deputy Prime Minister (An Tánaiste) Frances Fitzgerald and performer Panti Bliss, IrelandWeek will be a unique blend of conference styled breakout opportunities to learn about the international trade benefits of Ireland as well as live entertainment events that share the global talent of the Irish people. The week will see varied and compelling events with a full and comprehensive program rolling out around Los Angeles, encompassing the myriad of cultural layers that make up Ireland, past, present, and future. CONNECT353, the conference component of IrelandWeek, will take place Oct. 18 and 19 at LA Live Regal Theater and will have a series of panel discussions and keynote speeches ranging from film, TV, animation, technology, gaming, music, culture, arts, tourism, Brexit and the Silicon Docks Story. The rest of the week will host a series of events featuring arts and culture from Ireland such as famed drag queen & host Panti Bliss, Golden Globe-nominated Brian Byrne will present Goldenhair Live featuring special guests and Irish celebrity chef Donal Skehan. Ireland has a thriving, highly globalized economy with a pro-business attitude enables companies to set up swiftly, with minimum red tape, in a connected environment. Ireland shipped US$128.1 billion worth of goods around the globe in 2016. From a continental perspective, 56.8% of Irish exports by value are delivered to other European countries while 27.9% are sold to North American importers. Ireland ships another 11.5% to Asian customers while 1.1% goes to customers in Africa. Leading industries are pharmaceuticals, organic chemicals, medical equipment, electrical machinery and cosmetics. Over this extraordinary level of product export, is the export of services and intellectual, creative talent. Aer Lingus offers non-stop flights from Dublin to Los Angeles and has provided discount code IRLLAX17 for people traveling to Los Angeles from Ireland to IrelandWeek.